Hope's injuries prevented her from providing enough food for her month-old baby, which was found severely malnourished and died on the way to the clinic. 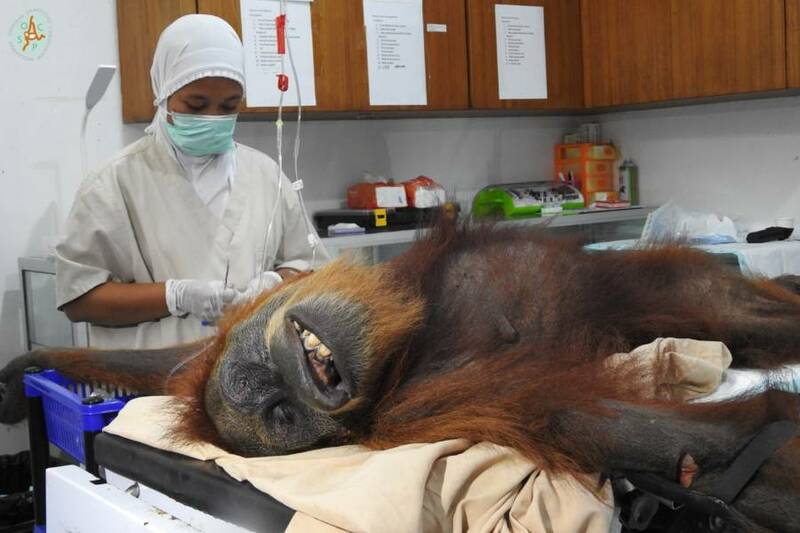 Indonesian Ministry of Environment and ForestryHope the orangutan mid-surgery, suffering from a broken collar bone and 74 air rifle bullets lodged in her body. Indonesia’s endangered wildlife has been increasingly burdened by encroaching agricultural interests, including the palm oil industry. For Hope, an Orangutan mother on the island of Sumatra, that clash resulted in her receiving 74 air rifle bullet wounds and subsequently becoming blinded. According to TIME, villagers noticed the wounded ape in a farm in Aceh province’s Subulussalam district last week. Hope’s severely malnourished month-old baby was with her when the mother was discovered, but died when rescuers rushed the two animals to a clinic in the Sibolangit district. The 74 air gun pellets are still lodged inside Hope — four of them in her left eye, and two in the right — with numerous other wounds believed to have been caused by yet unidentified sharp objects. Hope is currently recovering from surgery to repair her broken collarbone. “Hopefully Hope can pass this critical period, but she cannot be released to the wild anymore,” said veterinarian Yenny Saraswati, who works for the Sumatran Orangutan Conservation Program (SOCP). 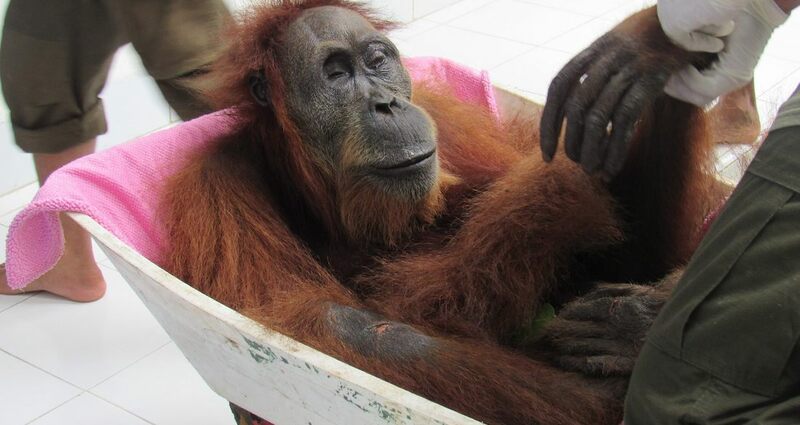 As it stands, only seven of the pellets have been removed from Hope’s body — the broken collarbone, and the inherent risk of infection it provided, were prioritized after the orangutan’s rescue and subsequent treatment. The SOCP said that Indonesia has a major problem regarding the affordability and readily available nature of air guns — and that locals don’t hesitate to shoot and kill regional wildlife at all. The program also said that it has treated 15 orangutans with a total of around 500 air gun pellets in their bodies in the last decade. Only last year, an orangutan in Indonesian Borneo died after being shot more than 130 times. It was the second known killing of an orangutan that year. Unfortunately, the palm and paper industries have had a disastrous effect on the region’s wildlife. A comprehensive 2018 study of Borneo’s orangutans estimated their population to have shrunk by more than 100,000 since 1999 — largely due to the encroachment of these businesses on the habitat. Around 13,400 Sumatran orangutans remain in the wild. The International Union for the Conservation of Nature has listed the species as critically endangered. Fortunately for Hope, the traumatized orangutan mother seems to be steadily improving. According to IFL Science, Indonesia is the world’s primary producer of palm oil. The substance is cheap and tremendously versatile; around half of the packaged products found in supermarkets, including chocolate and shampoo, contain palm oil. Unfortunately, Hope seemed to have become an unwitting victim of this quest for profitable resources — and lost her baby in the process. Thanks to the SOCP, the brave orangutan may soon get back on its feet, however, and likely spend the rest of its life protected from the violence that killed her baby. After learning about the orangutan who was blinded and shot 74 times, read about the Tapanuli orangutan being on the verge of extinction. Then, learn about Mike the headless chicken.